The historical Buddha Shakyamuni was born as prince Siddhartha Gautama about 2560 years ago, to a royal family in what is now Northern India. From early childhood, he was surrounded by wealth and beauty, and enjoyed a sophisticated education. The texts describe him as tall, strong, and blue-eyed. When he was 29 years old, he left the palace for the first time and encountered an old person, a sick person, and a dead person – experiences he had never known before. He then realized that nothing was permanent and left his palace to meditate in the mountains and forests of Northern India. After a six-year search for lasting meaning, he recognized the nature of mind while in deep meditation in what is Bodh Gaya in Northern India today. He reached enlightenment – a state of lasting, limitless happiness which is the full development of body, speech and mind. 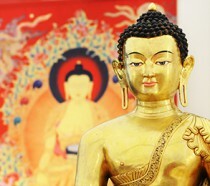 Buddha taught for 45 years in the highly developed Indian culture. During his constant travels, he encountered different kinds of people and gave general and specific advice for all life’s situations.